cell to improve output symmetry and accuracy. The cell also now is available with USB output and metric threads. It’s offered in 500- to 5000-lb. 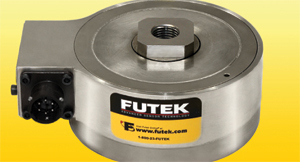 capacity, and features heattreated 17-4 stainless-steel construction for optimal performance. Other upgrades include zero-joint failure, low impact due to extraneous loads, and the ability to handle off-center loading more efficiently and effectively.